Eneclann traces Tom Cruise’s Irish Family HistoryWhat’s going on? Our big news story is that Eneclann’s Fiona Fitzsimons and Helen Moss recently traced Tom Cruise’s Irish family history – you might have seen it mentioned on a number of TV and radio shows and in newspapers. We found a fascinating and very unusual Irish family history, including an Anglo-Norman connection and a return to Ireland before the famine. We have prepared a new online exhibition for the research, where you can find the full story, Tom’s family tree and video clips of his reaction. There’s a load of interesting history, genealogy and archaeology events coming up – too many in fact to detail in this newsletter! Take a look at our events page for more information on Maritime Matters at Hook Head Lighthouse, Ancestral Connections genealogy summer school, genealogy workshops at the Ferns Gathering, From Known Knowns to Unknown Unknowns conference and the National Genealogical Society show in lovely Las Vegas! Ancestral Connections: names, places and spaces is a University College Cork genealogy summer school offering a complete course in the latest Irish genealogy research. All aspects of the subject are covered by a series of presentations and ‘hands on’ workshops given by a selection of Ireland’s leading genealogical lecturers and experts, including Eneclann’s Brian and Fiona. The latest online and offline sources are described and explained in presentations which will be of great interest to the seeker of Irish roots and family history, whether beginner or expert. Read more about what else is going on . This newsletter we launch our new and improved Irish Wills Package. This special offer bundle is for genealogists who have some archival experience and are ready to extend their research range beyond the most commonly used sources. Vicar’s Index to Prerogative Wills, Philimore and Thrift’s Indexes to Irish wills (as taken from the Diocesan Courts) and The Dublin Will & Grant books 1634-1858 are included in the package, recording nearly 200,000 wills, administrations and marriage licence bonds. Remember also that these titles are available to purchase individually, either as CDs or to download. 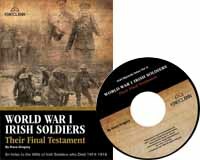 You might also be interested in our World War I Irish Soldiers: Their Final Testament. During the war soldiers sent to the front line were encouraged to write their last will and testament, if they did not survive these wills were registered, 9,000 of these wills are deposited with the National Archives of Ireland. The index contains an estimated 18,000+ names and is fully searchable. Just a reminder that you can still avail of the free genealogy advisory service at The National Archives of Ireland from 10am to 1.30pm, Monday to Friday. Some of the foremost experts on genealogy in Ireland are on-call in the National Archives to answer your family history queries. The genealogy service marks the successful collaboration of Eneclann and Ancestor Network, in partnership with the NAI, who bring together the talent and skill of some of Ireland best known genealogists. No booking is required, but access to the genealogist on-duty is on a first come, first served basis. 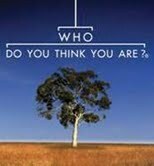 The fifth season of Who Do You Think You Are? began on Tuesday 2nd April. We did the Irish research for this series, as indeed we have done for the earlier seasons. 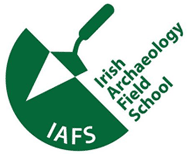 Eneclann would like to extend a hearty congratulations to the Blackfriary Community Archaeology Project, which was listed amongst the top ‘places that can change your child’s life’, by Keith Bellows, Vice President of the National Geographic Society. In an interview with CNN Travel, Keith Bellows identified this community project as one of the outstanding ‘slice-of-life, age appropriate ideas for special places that offer life experiences and peeks into different cultures’. Read more about the project. Congrats to our prize draw winners from last month’s St Patrick’s Family History Centre in the Discover Ireland Centre in Dublin. We’re pleased to announce that C.J. Nangle, Mary Ryan and Orla Kennedy have each won €100 worth of Eneclann publications of their choice! Welcome to all our new subscribers who read about us in Irish Lives Remembered! Until June we will be selecting two new subscribers who will each receive an Eneclann CD or download of their choice. This month’s winners are Penny Peace and Mervyn Johnson. We will be in touch soon with all of our winners – and well done again!